So if the desktop is no more what about your data and drives? Venture Beat is a great source of information and has some great articles focused around Cloud providers and watching the Cloud space to see what is up and coming. What is fascinating is the fact that I came across an article talking about how the desktop will be the thing of the past soon, in that I mean the desktop computer, which within my 2013 Predications post I had stated and will still stick to this fact – this is of course my opinion and not based on any widely scientific facts expect for the point of what is happening within Enterprises – BYOD, Ultrabooks, Tablets, VDI, Desktop-As-A-Service need I go on..! Now I have been a great fan of Oxygen Cloud for some time now having (designed and) deployed (a number of times) and used their products, in fact these guys offer something truly unique within the Public / Private Cloud Storage space – they offer a truly secure Enterprise Private Cloud Storage Gateway for Enterprises (and a freeium version for domestic Public Cloud use) – thats right no more worrying about the insecurities that have been in Dropbox in 2012 or here in 2011. They offer a number of appliances that are stored within your Enterprise, behind YOUR firewalls (so no more worrying about BYOD or Data Leakage, let alone Sovereignty of data) which can integrate with Active Directory, RSA 2 form factor authentication and auditing appliances. It is as simple as One-Two-Three and plug in some of your storage into these appliances and within minutes you have built yourself a Private Cloud Drive available on any device, anywhere and any time – I could go on but will write another article on how Oxygen works. Why not try it for yourself and get 5GB free and compare it to the others – sign up here. But do ask yourself if the desktop computer is a thing of the past how will your offer your internal users the same access, same data and know it is secured within your enterprise or corporate network….um……..! 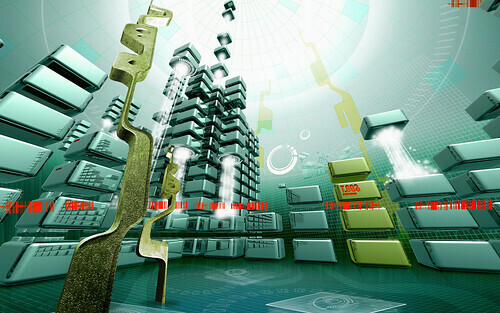 Gartner predicts that 821 million smart devices will be sold worldwide in 2012. In her latest Internet trends report, Mary Meeker shows how the Wintel empire will only represent 1/3 of personal computing devices by the end of the year. Forrester Research says that 74% of workers already use at least two computing devices, and they want access to their content across all of them. Enter the consumer personal cloud. Your desktop takes a back seat to a massive hosted file server called iCloud or SkyDrive or Google Drive that together could store as many as 5 trillion files by 2016. Post back and information from this post can be found in the Venture Beat Article “The Death of the Desktop Means a Rebirth in IT”. Welcome to my 2013 Predictions. I cannot really say Happy New Year this far into January however as tradition I wanted to get my thoughts and predictions for 2013. This is my yearly post where we look back on 2012, the technological advances or trends of last year and more importantly look forward to 2013 and see what the next 12 months will bring into the Tech Industry. Of course I will still add that these are my own independent opinions and not related to an vendor or manufacturers. Apple – We had the iPhone 5, iPad 4, iPad Mini (still thinking of getting one but I suspect as you will see below I may wait until the iPad Mini 2 comes out, depending on rummors) and the updated lines on the iMac, Mac Book Air and Pro. Cloud – Well before we keep talking about different cloud service models such as IaaS, PaaS, SaaS, Public, Private, Hybird and Hyper Hybird. We saw Amazon AWS take off and go up against Microsoft Azure and the success of Microsoft Office 365. There had been so much talk and hype within the media around cloud, how you can save your CapEx budgets and move them into an OpEx Pay-As-You-Go model, not need to worry about infrastructure and have uptime statistics that we all dream of – all this for a simple credit card payment – Of course I am simplifying this but these are some of the attractions and benefits that cloud brings, but not without risk businesses need to ensure they assess, invest the time and select the right suppliers. I could go into the Pro’s and Con’s and provide some real world experiences but they may come in a later post, for now the UK uptake has mainly been around Test and Development environments, small businesses or companies that are not regulated or come under any compliance rulings. Some of the biggest cloud providers also suffer from issues, I believe Amazon had a number of failures within the US in 2012 not forgetting the NetFlex issues. Microsoft had some issues towards the back end of last with some email issues – so it goes to show that these providers do from time to time have problems but of course I bet their downtime is still less then your own and their resilience and failover will only improve from these incidents. Big Data – My interupretation of Big Data is really the over hyped media of the next stage of evolution from data warehousing. Vendors developing faster, better and more intelligent platforms to crunch, transform and analyise data. These systems change from using structured relational databases to a more flat structure with intelligent logic to tackle to compute and analysis. I am sure most enterprises have the move on their roadmap but of course we need to think of the operational issues around putting all your eggs into one basket so to speak – the larger these warehouses get the harder to support, backup, restore and make highly available it will be. Virtualisation – You may think it is strange for me to put this down, I am in agreement with you but having talked to a large number of peers in 2012 I was surprised to see how companies are still making the move to virtualisation and only just realising these benefits. We see VMware having to bring out small business editions (or kits) of vSphere to tackle Microsoft or Zen dominating this market, lets see what 2013 brings us..! BYOD – So “Bring-Your-Own-Device”, we have seen how demand for consumer grade devices have been pushed into the business (both small business and enterprises) – why do people want a work desktop / laptop, smart phone, tablet and then their homes devices – surely we can work in a more smarter and agile way. Of course for small businesses this makes sense and should help reduce their overheads but for enterprises the risks around data leakage and how to protect their corporate network from any old device is a problem. To me this IT consumerisation demand brings back memories of the old main frame age – where we are going to have to provide a virtualised desktop or application streaming if we have any hope of BYOD take on. Many new vendors operate in this space now to manage these devices and secure them as does vendors offering always on access to your data (business or personal) anywhere, any time and on any device. Ultrabooks – Following Apple and the Mac Book Air last year saw a number of small ultra portable laptops called Ultrabooks – this bridges the gap between laptops and tablets. More to come on this below for my thoughts on 2013. Ok so looking forward to the next 12 months what trends or predictions do I think we take over in this. In summary I believe this will be the year of the desktop dimise moving more into the mobility space with companies looking more at their BYOD strategy or providing more laptops / come Ultrabooks. Compound this with the mobile warrior work force or more companies reducing their overheads and pushing more flexible or home working policies in place. Ultrabooks – This year will see an explosion with the manufacturers bringing lighter, higher performance models and touch screen, so will tablets still be around with this – probably but it will be interesting to see what happens. Lets look at what Windows 8 will bring, the touch experience will change how people interact with their computers – without touch screen I cannot use Windows 8 until they bring back the start menu within the desktop environment. I do strongly believe that desktop sales will still keep reducing, Windows 8 sales will improve and mobility will increase. Microsoft – So as mentioned Windows 8 is now released from the stats I saw before Christmas around 70 million copies sold worldwide which is approximately 4% down against the Windows 7 sales – but I do like the touch interface and the active tiles in a fantastic feature. My issue is the desktop, going into the desktop environment is great and helps remind me of Windows 7 but where is the start menu? Microsoft have removed this to force people going into the tile interface and setting up your applications in tiles, the only option is pressing Windows Key + X to pull up a small menu of features – now I know you can download Classic Shell from Source Forge or Start8 from StarDock. I am sure with enough customer pressure we can force the inclusion within a Service Pack (please, please Microsoft) hence why you need a touch screen to get the full benefits of 8. We now see Office 2013 coming into public release soon which I love, 2010 was brillent and now they have excelled with integrating this into your SkyDrive, abit the interface looks to “fancy” for more but Outlook and quick replying to emails is one of the best improvements I have soon for long time. I am waiting to see if the Surface Pro takes off, personally I think it will enterprises will lap up the functionality and replace their iPad work force with these which can be secured and supported better compared to Apple. There is no forgetting SharePoint 2013 will be released with this wave including Exchange 2013. Apple – Ok I did not want to mention Apple but as I am typing this on my 1 year old Mac Book Air then I must – in my opinion Apple need to bring another game changer on the next gadget release this year – not just an Apple TV but something, I am not sure what or even if I can think of a gap. If not then I feel other manufactures bringing out cheaper tablets will take the lead just like Samsung and their Galaxy S3. Apple are rumoured to bring out the iPhone 6 with iOS 7, iPad Mini 2 and I am sure a refresh of hardware along their desktop and laptop range. Lets hope the Mac Book Air’s get the retina display while keeping the battery life decent and maybe some cheaper iMac’s with touch screen would be good. Big Data – yes this will get more traction, more enterprises dipping their feet into the water. Assessing companies, vendors and deployment options – instead of looking for on premise deployments could their be a marketing opening up for BigData-As-A-Service which will save companies time and improve costs. Hyper-V – More and more implementations and white papers are being released showing comparative stats and performance benchmarks of VMware / Zen VS Hyper-V 2012 – the ease of use, scaleability and license savings will show companies Microsoft means business. More and more of their products are offering some form of free or discounted license model to deploy on Hyper-V servers this will be the year that Hyper-V is now a strong contender to VMware. Home Broadband – FTTC (Fibre-to-the-cabinet) or FFTP / FTTH ( Fibre-to-the-premise / house) Hopefully BT and the Government will help push this forward and we will see higher and higher speeds being brought into the house. Social Media – Well we have Facebook, LinkedIn, Instagram, Pininterest and Twitter to name a few. Last week Facebook announced to the world their Graph Search this was collaboration with Bing (I think to start going up against Google) but this is not a text based search but more contextual, locational and based on your likes, dislikes and friends – so for example “What film shall I watch” should bring targeted films that I am interested in and then try XYZ cinema and is 3 miles away at 15:00. We should see more business social media focus with enterprise tagging, attaching metadata and using more and more collaboration portals like Box, Huddle or Jive and for the people that know me SharePoint 2013 will be released. Storage – More and more enterprise storage offerings will come out, we have seen in 2012 some issues with Dropbox, Oxygen Cloud focusing on the Enterprise, Citrix ShareFile, Google Drive and Microsoft increasing their Skydrive space. More and more of these service will focus around businesses or teams to work on cloud drives that appear as a local network drive. Cloud Backup – Or Backup-As-A-Service will find more businesses pushing their data out to provides for offsite storage / replication. These facilities are very good in fact one I am testing at the moment had my test environment of 6 virtual machines configured within 20mins (excluding time for me to update the vm tools). 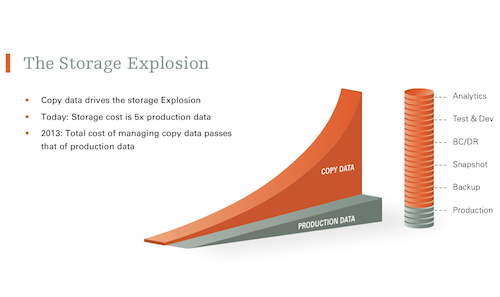 Copy Data Explosion (see below) – This is not something new but rather hidden within enterprises – the amount of wasted or copy data that sits within their infrastructure generally on Tier 1 (Flash, SSD or Fibre Channel Disks) or Tier 2 (NearLine or SATA) Storage. These tiers have a high cost associated with them but server and storage admins do not take this into account when a request from a developer comes in to clone server 1 or virtual machine 2 or even clone a LUN from a database to work on or improve on. We are know this is here but never really address it but IDC Analyst Ashish Nadkarni has some interesting facts and figures coming soon in his series of blog articles on the Copy Data issue. One company is trying to soleve this issue by reducing the copy at the source and providing a single master copy that is hardly duplicated and if it is then this is primarily on tier 3 storage, couple this with backup, restore, continuity, data migration, SLA based classification and a simplified GUI all in a single platform meet Actifio. NFC – Near Field Communications – the technology starting to be embedded with phones such as the Samsung Galaxy S3 and hopefully the iPhone 6. This will allow the sharing of contact information or the ability to do something when compatible phones come near each other – one idea of this is what Moo.com are doing with businesses cards, embedding a chip into the card to pass over information or direct people to their website check this link for more details. Gaming – Will we see the Xbox 720 or PS4 this year? What will be next for Sony? Will they offer more cloud based gaming, or better 3D improvements – I will still go back to my 10 year fantasy of virtual reality umm maybe one day..! So thats it for now, stay tuned and hopefully this year I aim to bring out a couple of posts each week on a variety of subjects that interests me, as a sample coming soon we look into improving my test lab, IT Consumerisation, backups, cloud and storage services. You don’t get to be one of the best companies in the world by being nice. When Apple announced their App Store subscription feature to iOS developers last year, they gave users the ability to subscribe to magazines and newspapers from within an app. In doing so, Apple also made any company hand over a 30% cut of each subscription made within the app. Apple also said any subscription must be made within the app, meaning a publication couldn’t take users from the app into the Safari web browser to sign up for a subscription behind Apple’s back. It seems Dropbox forgot about this guideline when releasing their latest SDK, as developers have been having their Dropbox-friendly apps rejected by Apple this week. Dropbox is a popular cloud-based service which syncs a folder on a user’s desktop with a folder in the cloud, allowing devices such as iPhone and iPad to have access to these files anywhere. When Apple first opened up the App Store, many began using Dropbox as a way to get around the iPhone’s lack of a file system. Apple and Dropbox have had minor run-ins before. In 2009, Steve Jobs reportedly offered Dropbox founder Drew Houston a nine-figure sum to buy the startup. After Houston and his partner declined, he warned them Apple would be introducing their own cloud option. iCloud was released last June, and while it doesn’t work exactly like Dropbox, it does provide seamless syncing across multiple Apple devices. So in this series I wanted to document my journey and experience with setting up (or migrating) a Mimecast Unified Messaging Platform. Part 1 gave an introduction into what Mimecast offered, the benefits of their cloud solution and the superb service you get guiding you though this process. Although this guide deals with the configuration and interaction with Office 365 (where our hosted Exchange environment is located) the process is similar to an Enterprise wide deployment. A useful tip here could be to setup a test Domain, add this to your existing email environment and just test the process on this test domain for a reduced risk migration. After you receive your “Super Administrator” (this is the account that has full access to every feature within the Mimecast Admin console) details from Mimecast it is recommended to first setup a series of users with the access you require. Log into your Mimecast portal and first review the default roles. Next Click on the “Roles” tab to display the built-in roles. Roles are predefined permission levels that Mimecast has provisioned – you can create your own but for this example we have setup another Super Admin. To select a role just click on that with the mouse, here you select the “Add user to role” function and select your required user. If the user is not listed you may need to manually add the user to your console – Directories – Internal – Click Domain Name and select “New Address”. Test you can login within the newly created account. Next have a play with setting up with a dummy or test user account and move them into the different roles. Later on down the line we will be looking at giving our Service Desk login rights to track messages etc.. Ensure ALL your domains are registered with Mimecast before proceeding, if you have any issues then please contact Mimecast Support. Add the Mimecast MX records into your DNS zone at the highest priority (i.e. if you records are currently set to a preference of 10, then select the Mimecast preference to 100) – this will allow time for the records propagate and then help in the next few steps. Notify Mimecast for them to monitor the outbound emails – these are used for Mimecast to configure a “TO” whitelist. I would recommend keeping this in place for 2 weeks.